The snowstorms that hit Missouri late last month and at the start of this month have given one of Missouri’s top traffic safety programs a stern test. Hundreds of cars and trucks slid off Missouri’s snowy roads during those snow storms, many of them plowing into the medians of divided highways. The transportation department says the safety cables in those medians were hit 504 times during those storms, tearing out thousands of feet of cable and posts. Department spokesman Laura Holloway says the cables kept a lot of things from being worse. “There will be quite a few feet of cable as well as the posts that will need to be repaired or replaced and we will work to get that done as quickly as possible so that guard cable is in place for motorists,” she says. Not all cars slid into the media. Some went to the right. 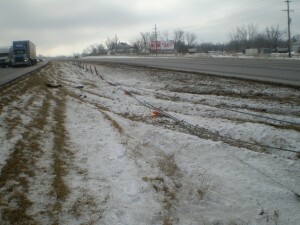 Holloway says the department district in northwest Missouri counted one guardrail hit for every two median cable hits. The department started installing the median cables about five years ago. In 2003, before cables were installed in interstate medians, there were 52 crossover fatalities. In 2008, there were only seven. The department has installed more than 600 miles of median cables on interstate and other divided highways.